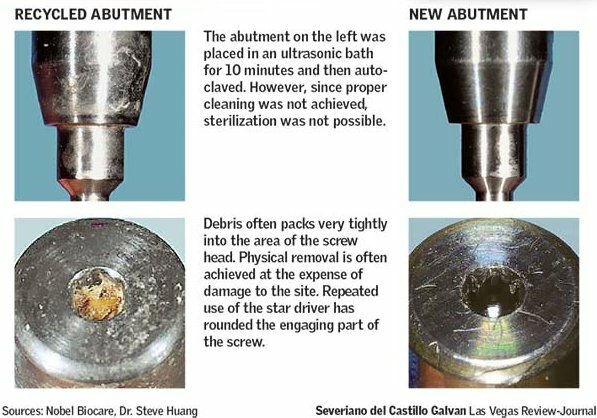 Single-use healing abutments were re-used in multiple patients after being sterilized in 184 patients at the University of Nevada – Las Vegas’s Faculty Dental Practice Clinic leading to the resignation of the director of the faculty group practice. “It’s not cost prohibitive, but it adds to the cost,” director Devore said. “Why buy something new if the thing you already have works just as well?” In addition to phoning patients, the university followed up with letters. Dr. Karen West, Dean of the School of Dental Medicine, said the school became aware of the reuse of the healing abutments in early September and began reviewing the situation immediately. West said the school follows best practices, and that includes not reusing a single-use item. She said it wasn’t written out in a policy, but that as soon as it was discovered, an email was sent to faculty, staff and students reiterating the policy. The school hired the Dentons Group to conduct the investigation. West said the investigation finalized the number of patients potentially impacted by the reuse of the healing abutments last week. “We are taking this very seriously,” she said. The state health officer was contacted to help guide the investigation.